If you don’t know about the Powell Memorial already, it’s a late model race that commemorates the family of James Powell, long time owner of what was formerly known as Ocala Speedway. Powell’s father and local racer Buddy Powell, along with his mother, aunt, uncle, and 4-year old twin daughters were killed in a plane crash in 1995, and this year marked the 19th race to celebrate the lives of those where were lost in this racing family. Ivedent Lloyd Jr.’s Buddy Powell tribute car. Perhaps the most emotional moment of the night came when driver and Powell family friend Ivedent Lloyd Jr., who usually runs the No. 21 car, showed up with a surprise in the trailer for James Powell. His car Saturday was adorned with a red No. 22 and a throwback paint scheme identical to the one James’ father Buddy used to run. Powell was visibly emotional at the sight of the car – so much so that Lloyd’s team put the car back in the trailer so Powell could regain his composure. As if by fate, Lloyd’s Buddy Powell tribute car was the fastest car in qualifying Saturday night and emotions ran high again when Powell awarded the pole to Lloyd and the No. 22. While I spent the evening in the infield interviewing drivers, Racin Nation’s Jimmy Rouse called the race as the regular turn-by-turn announcer for the United Dirt Late Model Challenge Series that sanctioned the race, and fellow show co-hosts Matt Nix and Sean Sullivan provided color commentary. Not too long after qualifying though, a major storm came through the area, drenching the track and suspending our broadcast. Although we weren’t on air while the Volusia Speedway crew worked hard to get the track ready for racing again, I still got the chance to interview some of the drivers for the fans waiting out the delay in the stands. This part of the night was especially exciting for me because it challenged me fill time by seeking out interviews and not just letting the interviews come to me. If there’s one person who knows how to fill a rain delay, it’s Sirius XM NASCAR’s Claire B. Lang. When there’s a rain delay on a NASCAR broadcast, you can guarantee Claire B. will be running around the garage interviewing anyone and everyone for hours on end and still providing thoughtful questions and entertaining conversations. She’s one of my favorites in the motorsports reporting world for this reason, and it was fun for me on Saturday to try to emulate her rain delay skills. One of the things about interviewing in a rain delay is that there aren’t very many racing-specific questions to ask (especially when all that has developed in the night so far has been qualifying), so an interviewer really has to let their personality shine through in these moments to create organically friendly and entertaining conversations. The tone of these interviews are definitely different than the mostly racing IQ-type interviews you often conduct in Victory Lane, but it’s always fun as an interviewer to grow and improve in other areas. I certainly enjoyed doing so during the rain delay on Saturday. Once we got back to racing, it was time to power through the heat races. Running on a shortened time schedule thanks to the delay, interviews with heat race winners had to be quick. This required effective communication from the broadcast booth down to me in the infield, and with the help of Matt Nix’s cues, everything went smoothly. Many drivers said after the rain that the track was fast, and although there wasn’t much passing in the heat races, they felt the track would be packed down just right for the feature. As it turned out, the drivers got it right – the Volusia crew did an incredible job of getting the track back up to speed after the weather setback. The feature was one for the books. After reporting on some breaking news that race favorite Ivedent Lloyd Jr. had unfortunately blown the engine in the Buddy Powell tribute car and would start at the back of the feature in David Clegg’s car, I headed back up to the broadcast booth to do a little color commentary with Matt and Sean. The No. 02 of Frank Nosbisch had challenged Lloyd for the top spot in qualifying and after Lloyd was relegated to the rear, Nosbisch was a clear frontrunner early in the 67 lap race. Mark Whitener in the No. 58 just wouldn’t give up though, pushing the high side all night long, several times getting a little loose into the cushion. Whitener’s antics had the crowd gasping when he got into Nosbisch in turn 4 as the two challenged for the lead late in the race. The No. 58 turned almost completely sideways, but Whitener was somehow able to save it and the second position, losing only a bit of momentum. Also remarkable was Lloyd stellar performance in Clegg’s car, taking it all the way from the rear to challenge in the top 5. On the air, I told Matt Nix Lloyd won the “Tori Petry Hard Charger” award since there were no official Hard Charger honors that night. His run was nothing short of impressive! 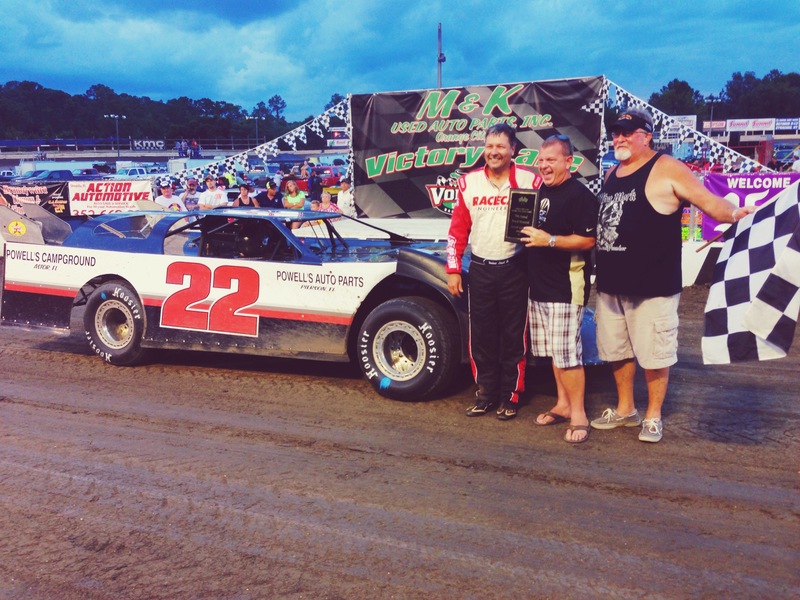 Mark Whitener wins his first-ever Powell Memorial. In the end, Whitener held on to pass Nosbisch for the win in the final laps, throwing a No. 1 signal out the window as he took the checkers. 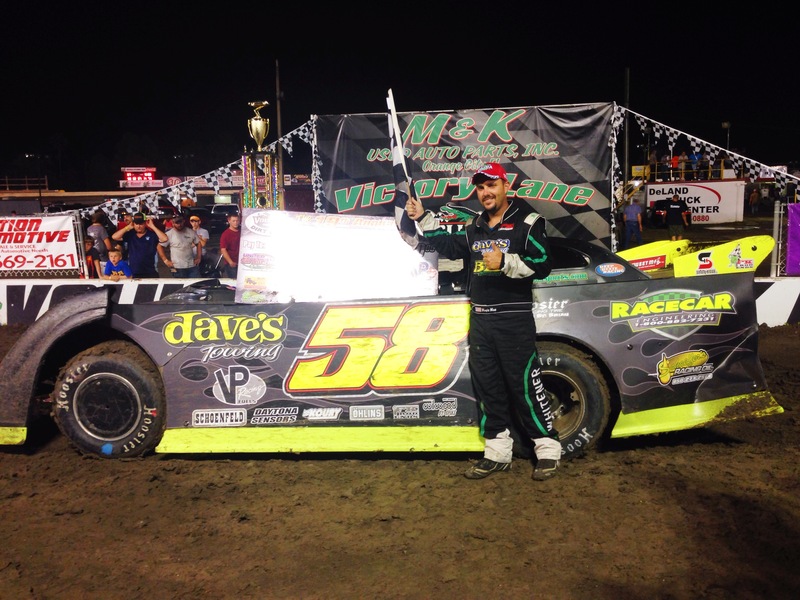 Although he won what was supposed to be the Powell Memorial last year, last minute changes meant that race was not officially deemed a Powell Memorial, so this win was considered Whitener’s first in this prestigious late model race. In Victory Lane, I couldn’t tell whether Whitener or James Powell was more excited! Both men were jumping and hugging each other and the celebration scene was one of pure joy. Powell certainly ended the race on a high note, and I know those of us on the Florida Sports Talk team hope it was a worthy tribute to the ones he lost. I can certainly say I ended the race on a high note as well. Every time I work on a live race broadcast, I fall more and more in love with it! There is really nothing that compares to the adrenaline and excitement of being on the scene at a live sporting event. I wasn’t made for an office – I was made to be out in the field! I know the whole crew is looking forward to this weekend’s broadcast for the Citrus County 100 at Citrus County Speedway. Tune in this Saturday at 7:30 to Florida Sports Talk powered by NBC to hear the Racin Nation crew in action once again! We look forward to bringing you more great on-track excitement in our Local Racing Heroes race broadcast series! This post originally appeared on Tori’s motorsports blog on the Florida Sports Talk Radio website.